An Elizabethan-style court jester has completed a 100-mile jig in a tribute to a 16th Century forbear. 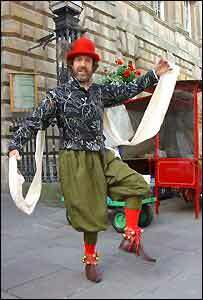 English Heritage's Peterkin the Fool - aka Peet Cooper - left Bristol on 12 July aiming to dance to Northampton. Inspired by the Shakespearean actor Will Kemp, he dressed in traditional 16th Century costume. Mr Cooper, 43, from Bristol, danced into Kelmarsh Hall, Northampton, on Wednesday. He said despite the pain and tiredness he would do it again. "I feel saddened that it's all over," he said. "The people who met us and jigged with us on the way were fantastic and on the whole very enthusiastic." Mr Cooper said the jester still had an important role to play in modern society. "I think the fool is the person who lives deep inside of all of us. We are very good at being self-important and pompous and foolishness is the right way to get rid of some of that," he said. In 1599, Will Kemp danced from London to Norwich in what came to be known as the Nine Daie's Wonder. The completion of the jig coincides with the start of English Heritage's Festival of History.